Edit March 2017: Adore Tea is no longer trading at Federation Square One, 6/18 O'Hanlon Pl, Nicholls ACT 2913, and is now trading at 10/12 Cheney place, Mitchell ACT 2911. 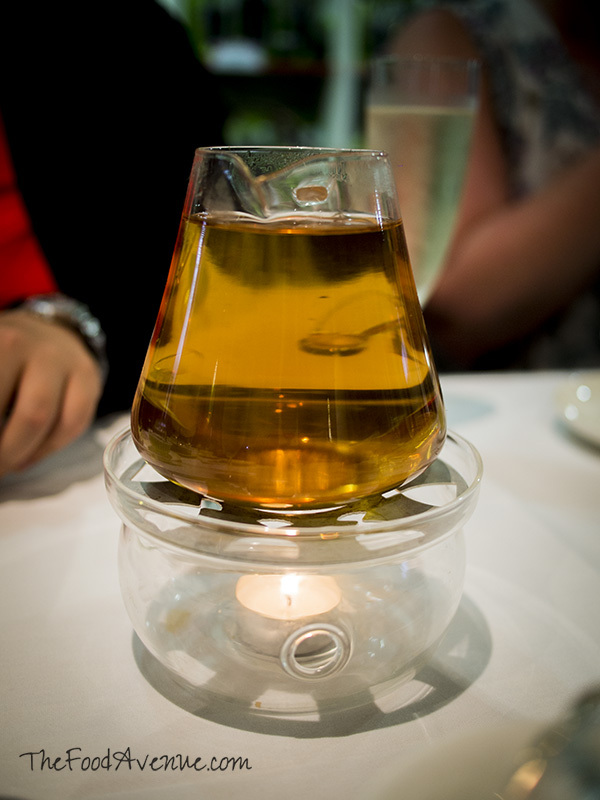 This tea-gustation was the second in a series of gastronomic adventures in the past week and was high-ly an-tea-cipated! :P (Italian and Sons kicked off the "farewell activities" for my friend Tania, who is going interstate for 3 months). Adore Tea is located in Federation Square in Gold Creek. It's part tea shop, part cafe. There's a large outdoor area, perfect for a nice sunny afternoon. Unfortunately, on the day of our event it was raining so much that I should have worn gumboots! Luckily, we phoned ahead and were able to get a table inside for our large group. We were all impressed by the colourful menus provided on the table. I thought it was a very nice touch and appreciated being able to refer to the menu throughout the four courses provided at this tea-gustation ($48). We were offered champagne to begin with. Someone commented that they were expecting French sparkling wine because that's what was on their website, but we got a Prosecco (an Italian sparkling wine) instead. I didn't mind this too much though. The food service had a bit of a shaky start. The sandwiches were a bit disappointing. The bread wasn't fluffy and soft. There wasn't enough flavour to the sandwiches...the bread-to-filling ratio wasn't right. A friend also noticed that the sandwiches had been cut fairly roughly and unevenly (some corners had been cut off as well for some odd reason). Top to bottom: cucumber sandwiches, radish sandwiches, turkey and cranberry sandwiches. 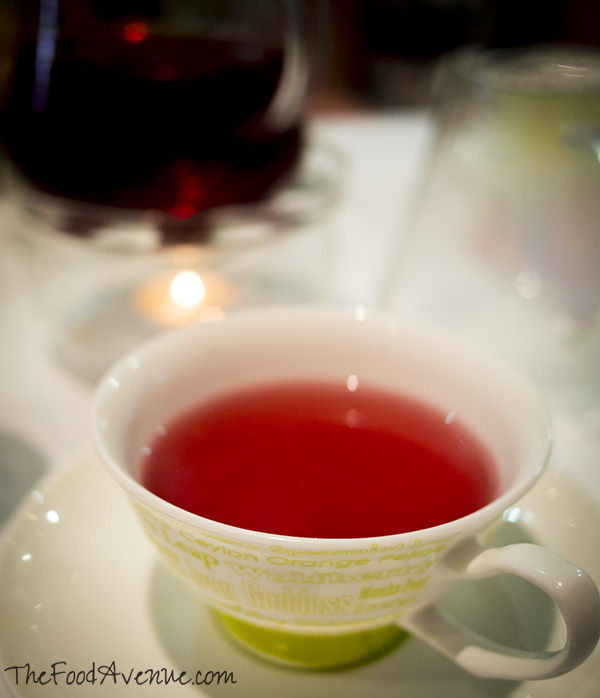 This course was "paired" with Darjeeling Vintage tea, which had a very subtle flavour. I was starting to get a little worried about the quality of this high tea but I got distracted by the cute ladybugs on the next stand. I wasn't the only one who thought they were cute (everyone else took a photo of the ladybugs too!) 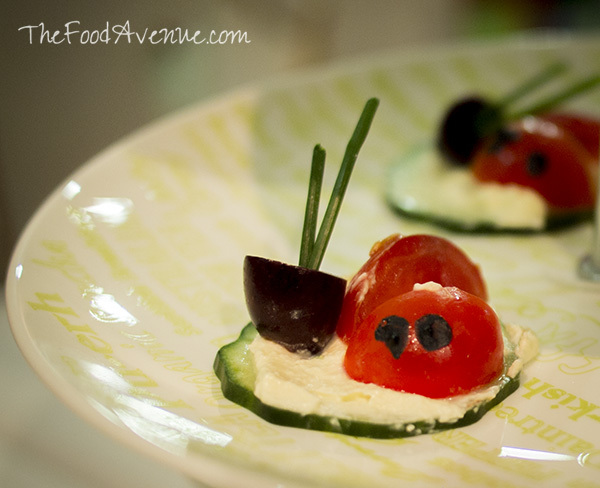 They tasted delicious, pairing well with the half olive. The spinach and ricotta on lavosh bread was fairly bland. The filling needed much more seasoning. But luckily, the corn salsa on the crustini and the almond gazpacho improved my first impressions of the high tea. I particularly enjoyed the almond gazpacho as it kind of reminded me of a savoury version of an Asian dessert soup. This course was served with a beautiful flowering white tea, which was visually impressive as it bloomed inside the pot! The most impressive stand that came out contained the sweet treats. This is how Adore Tea made us forget about the last two courses (as you can see by the photo below), which were just warming us up for the main event. I loved the mango pistachio mousse. The fact that I could not taste any pistachio flavour at all did not detract from my enjoyment of the dessert (and I love pistachio!). The texture was light and and the mousse had a beautiful mango flavour. The banana caramel tart was perfect. Just the right amount of rich caramel creaminess balanced by the fruity flavour of the banana. Plus the crispness of the tart shell was divine. The strawberry tart was kind of like a friand and it was ok, but it didn't impress me like the other ones. I was very impressed with the scones. They were still warm by the time I got to them, after tasting all the desserts on the above levels of the stand. I cannot emphasise enough that the temperature of scones makes all the difference. Having a cold scone is just not the same, no matter how great the scone actually tasted. But fortunately, the scones were also light and fluffy in texture. Heaven. The (presumably) house-made strawberry and blackberry jams were wonderfully thick and flavorful, rich in fruity flavours. 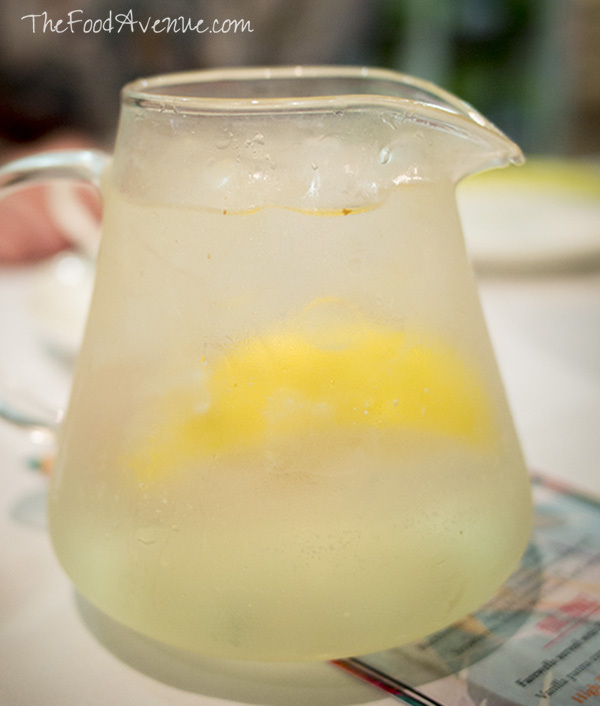 This third course was accompanied by a Japanese Lime iced tea, which was light and refreshing. A perfect match for the flavourful desserts. Lastly the final service came. I love panna cotta. If it's on the menu, I'll order it. Adore Tea's panna cotta was good. It had a lovely vanilla flavouring throughout and it had a great consistency. And it left me wanting more. I'm glad I didn't though, as I felt quite full afterwards and would have happily welcomed a nanna nap! 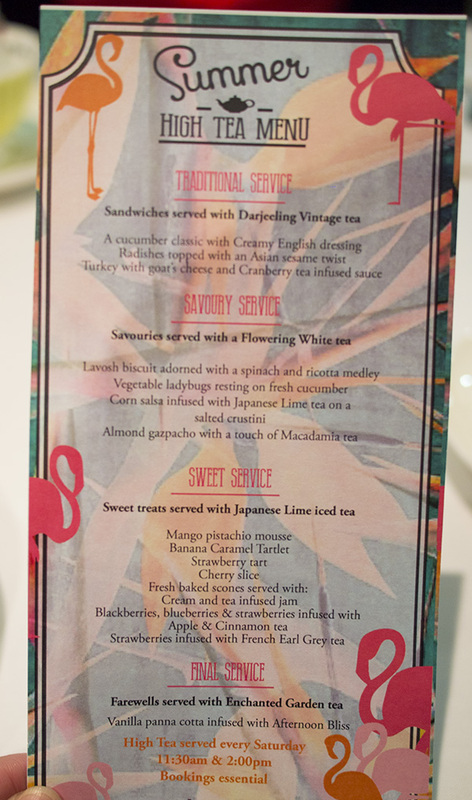 The panna cotta was served with Enchanted Garden tea, which tasted as wonderful as its name sounds. The final two courses were what set this high tea apart from others that I have tried. I don't like having to fiddle around, cutting up a tiny dessert so that others can share it. For high tea, it's better if they make individual treats so that you each get one. Also, it's important that EVERYONE gets EVERY type of food that is presented (or there could be a scuffle over a missing cherry slice). Adore Tea gets full marks for this point! I found that the teas matched really well to the food, if a bit too subtle in flavour for my liking. I would have preferred if they had made the teas a bit stronger. A few of my friends liked the teas so much that they decided to buy some to take home. Although the tea-gustation had a bit of a shaky start with the below-average savouries, Adore Tea more than makes up for it with their incredible desserts. I don't go to high tea for the sandwiches, it's the little cakes and sweets that will impress me (as I can't bake to save myself). I'm not a regular tea-drinker either, but I did really enjoy each of the teas that were served with each course.